Well, Dan and I just dropped Chloe off at the vet. She has surgery scheduled today to remove a bladder stone. Poor little girl. She's been getting bladder infections off and on for months now because of this. We tried to treat it with food, but no go. So surgery it is. She'll have to spend the night tonight but we'll have our Chloe back tomorrow, stone-free. Yay! Update: Chloe came through the surgery fine! There were a few issues in regards to finding the stone - apparently it managed to slip out without being noticed - but it was recovered so it can be sent off for analysis (so we can figure out what diet change Chloe needs to have to prevent this from happening again). We'll be able to bring her home sometime tomorrow. Until then, she's doped up and resting comfortably. 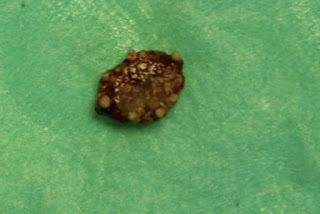 And speaking of comfortably, or rather uncomfortably, this is a picture of the (eraser-sized/disc-shaped) stone that came out of her bladder! The vet texted me the pic so it's not the most high quality thing, but honestly? It looks pretty nasty so I'm not sure if I want to see it in full detail! Isn't it gross? Dan says it makes him think of a reptile but I'm more of the mind it is an evil meatball. Yuck! Poor, Chloe. Glad she's through the surgery and better now! Me, too! Can't wait to have her home today!